BC SPCA officials announced today that necropsies conducted by internationally known forensic veterinarian Dr. Melinda Merck on the remains of mutilated cats and other animals found in the Lower Mainland, have determined the animals were victims of predator attack. Initial findings from pathologists and veterinarians, combined with the unusual placement of the bodies, had raised the possibility of human involvement, but new forensic science brought to the investigation this week reveals evidence of death by predation. In total, Dr. Merck conducted necropsies on 30 animals found in recent weeks, including 20 cats, eight birds, one rabbit and one dog. The BC SPCA says that while a conclusive cause of death could not be determined in five cases where only a tail or leg remained, these body parts also showed evidence of predation. “The definitive cause-of-death results we do have, combined with additional evidence of predator attacks on isolated body parts, leads us to conclude that the animals were victims of coyotes or some other predator,” says Marcie Moriarty, general manager of cruelty investigations for the BC SPCA. The BC SPCA is currently working with DNA experts at Simon Fraser University to confirm if the predators involved in the attacks were coyotes or some other animal. SPCA investigators have also alerted conservation officers regarding the necropsy findings. “We are incredibly fortunate to be able to integrate this level of leading-edge forensic knowledge into our investigations and we are grateful to Dr. Merck and to the experts at Simon Fraser University for their assistance and to the RCMP for their invaluable help,” says Moriarty. While the necropsies have revealed evidence of predation, Moriarty says any new cases will continue to be examined fully for all possible causes of death, including human involvement. “RCMP detachments in the Lower Mainland will continue to work with the BC SPCA on the few outstanding instances where human involvement in handling the bodies is suspected,” says Insp. Dave Fleugel of Ridge Meadows RCMP and Insp. Steph Drolet of Langley RCMP. Dr. Melinda Merck is an internationally known forensic veterinarian consulting on cases involving animals. Dr. Merck assists investigators of animal cruelty with crime scene investigation as well as the examination of live and deceased victims. She helps with large scale operations including exhumations of burial sites and examination of skeletal animal remains. She frequently testifies as a veterinary forensic expert for animal cruelty cases, including cases involving animal fighting, neglect and trauma. Dr. Merck is a member of the Board of Directors for North American Veterinary Conference and is Program Chair of the Veterinary Forensic Science track. Dr. Merck is also a member of the Board of Directors for the International Veterinary Forensic Sciences Association. She is the author of the textbook, Veterinary Forensics: Animal Cruelty Investigation, and co-author of the book Veterinary Forensic Investigation of Animal Cruelty: A Guide for Veterinarians and Law Enforcement. Dr. Merck frequently provides training for veterinary, attorney and law enforcement professionals internationally on the use of veterinary medical knowledge in the investigation and prosecution of animal cruelty cases. 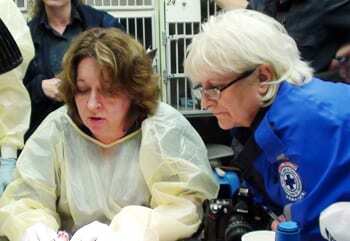 She developed the first Veterinary Forensics course for the University of Florida veterinary school and frequently lectures at other veterinary colleges. She teaches workshops on animal crime scenes and the processing of burial and surface remains. She is a member of the American Academy of Forensic Science and the International Association of Blood Stain Analysts.